Tooth whitening or tooth bleaching is a procedure in cosmetic dentistry, which involves placement of bleaching agent on the teeth via various means to achieve a whiter and more cosmetic smile. As we age, the adult teeth become darker than they were when they originally came into our mouths as children and adolescents. This darker color comes from a natural process within the tooth and from environmental products such as foods, beverages and habits such as smoking. 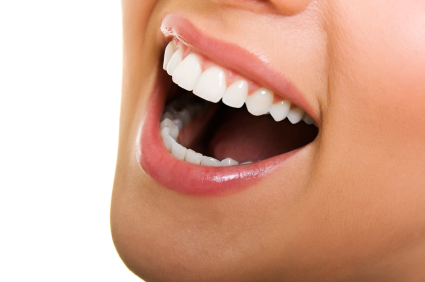 The bleaching process entails an oxidizing agent being placed on the teeth. These agents include carbamide peroxide or hydrogen peroxide, which act to lighten the teeth. The agents penetrate the pores in the enamel and break down the stain particles caught inside the tooth that cannot be brushed or flossed away. The effects of the bleach can last for up to a year depending on maintenance and factors such as smoking and consumption of stain causing foods/beverages such as coffee. Bleaching can be done with over the counter kits or with the aid of a dentist. Dentist regulated bleaching tends to be more effective, longer lasting and safer because the dentist can use a much higher concentration of bleaching agent and can aid in any complications. The possible complications of do-it-yourself kits are numerous and they include chemical burns of the gum tissue and moderate to severe tooth sensitivity. Over the counter kits are disposable and carry up to 10% peroxide in a prefabricated tray. This tray may or may not cover all your teeth. In office bleaching varies from 12-35% peroxide. There are three in office procedures that you can have done by your dentist that vary in fee. The least costly is a disposable tray system that has a very high concentration of peroxide and can be used for up to ten days. The next and most cost effective system is a custom tray system. The doctor takes an impression of your mouth and a tray is made to fit your mouth only. Gel is applied at home for a period of 1-3 hours. This tray can also be used for fluoride gels, which prevent sensitivity and cavities in the future. The third system is a laser-light in-office treatment. Bleach is applied to your teeth and a special light is placed on the teeth to expedite the bleaching. The whole procedure takes one hour and can last several months to several years. The risks of chemical irritation to the gums and possible tooth sensitivity are temporary and disappear in 1-2 days after completing or interrupting treatment. These risks increase in individuals who have gum disease or cavities. Those allergic to peroxide based products should not bleach their teeth and those who have pre-bleaching tooth sensitivity should consult their dentist and pursue in office treatment. Teeth whitening are also not recommended for individuals who are pregnant, nursing or under the age of 16. Whitening products do not change the color of existing dental work including fillings and crown/cap work. Consultation with a dentist is necessary to evaluate and mouth prior to bleaching. It may be necessary to change some fillings/crowns due a difference in shade. Bleaching is a very effective way to improve both an individual’s smile and self-confidence. Generally, the American Dental Association and consumer safety organizations recommend that bleaching products should only be used after consulting with a dental care provider.